This rich, creamy Caramel Hot Chocolate tastes absolutely decadent yet is completely dairy free, paleo, vegan and made with only whole food ingredients. 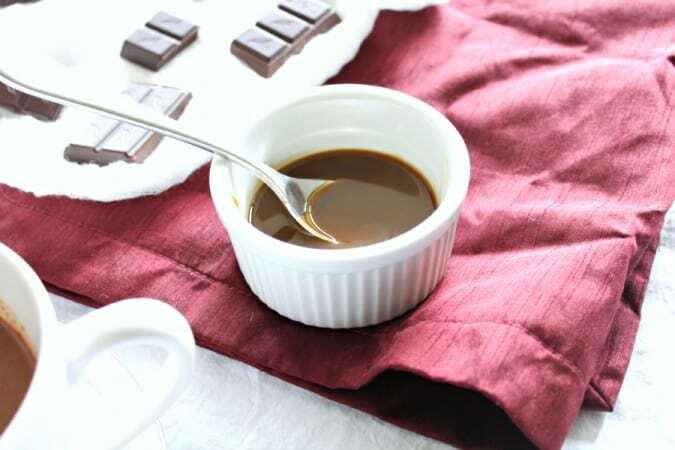 Melted dark chocolate in almond milk is swirled with an easy homemade dairy free caramel sauce for this ultimate winter night treat. The caramel kick is not over! In fact, after this, I feel like the possibilities are just opening up. 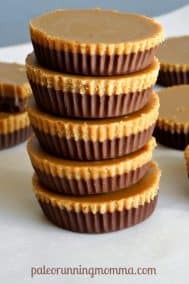 Remember the Chocolate Caramel Fudge Cups? I hope you do, because even though it feels like I made them 2 months ago, I think it was just last week. Like I said yesterday, it’s been quite a long week for me! Anyway, after I made those fudge cups, my daughter Emily wanted me to make caramel hot chocolate. Of course my talented little blog-helper had a great idea, given that it’s now December, the holiday season, and people want hot, dessert-y drinks. Plus, my hot chocolate recipe from last year has been begging for a makeover for a while, so I took this as the opportunity to do just that. Let’s face it, creamy hot caramel sauce makes anything and everything a whole lot more attractive (and delicious), don’t you think? Do you need more selling on the caramel sauce? Okay, I’ll tell you what’s in it, and how easy it is to make. Because I only needed this caramel sauce in liquid form, it’s a lot more basic than the caramel fudge from last week. Just 2 ingredients – coconut sugar and coconut milk – heated while stirring, create this yummy syrup. And you should know, in case you’re not a fan of coconut flavor, that when this is finished you do not taste the coconut milk at all. Nope – just delicious dairy free caramel syrup – you seriously will not know what hit you after the first taste! Try not to start eating it by the spoonful though, it’s definitely sweet! 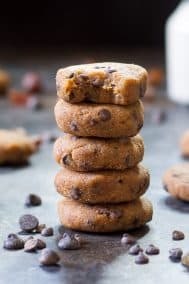 So, for 4 ingredients total I’m telling you this is 100% worth it the next time you have a chocolate craving. Plus, I left you with just enough extra caramel sauce to save for a rainy day, or to lick out of the bowl whenever you damn well feel like it. Hint – you might want to do that sooner than later though, because as soon as someone else finds it, they’ll most likely be the one doing the licking. 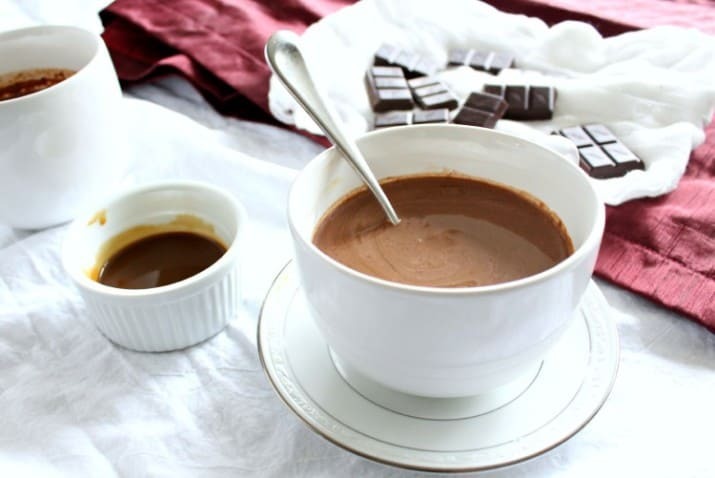 And let’s get on with this recipe already for Caramel Hot Chocolate! Emphasis on the caramel. Sorry, I’ll stop now! In a small saucepan over low heat, combine the coconut sugar and coconut milk, stirring continuously until combined. Continue stirring and bring to a boil, scrape the sides while stirring to make sure the sugar doesn't burn. Once boiling, lower the heat to a simmer and continue to stir and cook for 5-7 minutes, until deep golden brown, shiny, and thickened. Remove from heat and set aside while you prepare the hot chocolate. Add the rest of the almond milk and heat, stirring, until bubbles begin to form. Serve right away in big mugs and swirl in caramel sauce as desired - the more you put in, the sweeter and creamier it will be! Makes 3-4 servings. What winter/holiday treats are you in the mood for lately? Any fun weekend plans? Do tell! My son asked for hot chocolate when he was home last weekend. I wish we would’ve had this recipe. Looks so good Michele! He’ll be back for Christmas and we’ll make it then. Yum. 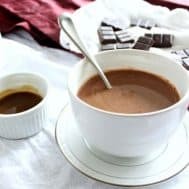 I love hot chocolate this looks really easy and I have the ingredients which is always a plus. I can’t believe Hanukkah is this weekend already! Easy ingredients and lots of stirring – that’s it! And don’t remind me, I still have shopping! I wish I could just lay inside under a blanket all day drinking this! Looks delicious! We never have hot chocolate in the house but we usually have all those ingredients. Yum! I just mad vegan hot chocolate last night. I need to try the caramel sauce next time. It sounds delicious! And I just died. May I rest in peace. Feeling a lot better except for the whole antibiotic-stomach stuff. Not fun, can’t wait until it’s all over! bring this over and we’ll have a chocolate and eggnog party! OH YUM! I want a big cup of this and a fireplace to drink it by. I love how simple the ingredients are! Perfect to drink with some dark chocolate caramel gelt for Hanukkah, I think! Yup, I imagine it would be amazing with anything – and so easy! 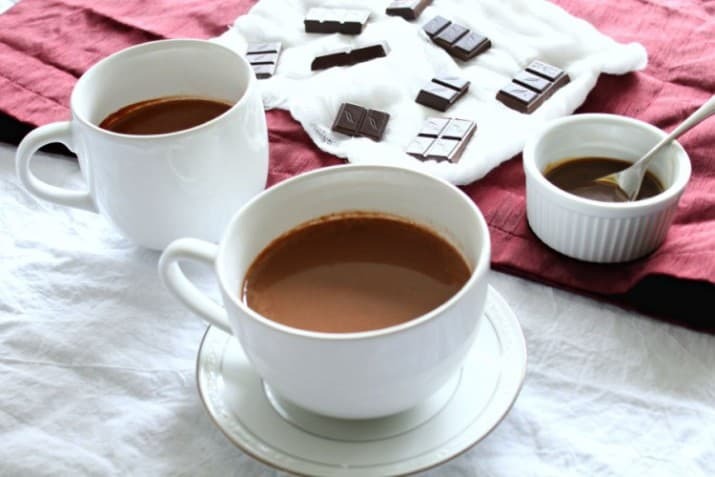 I’m actually going to make this right now – Storm Desmond has hit Ireland, with wind & rain swirling outside the house so hot chocolate sounds just perfect. 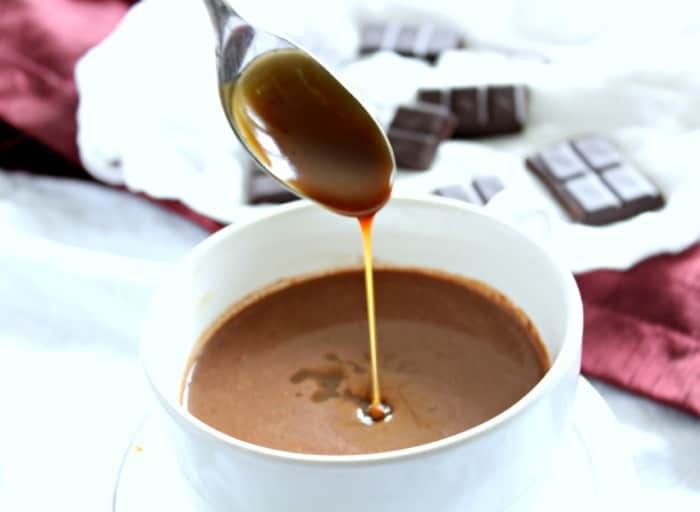 Besides, your photo of caramel dripping from the spoon into the hot chocolate is just too good! I hope you made it and liked it! God this was good. Although, I probably, no in fact, I KNOW I ate more caramel than actually made it all the way into the hot chocolate. Great recipe, THANK YOU! You go ahead and feel free to stay on the caramel kick because I for one am I huge fan. And in liquid form no less, count me in.